The cultivation of the domesticated grape began 6,000–8,000 years ago in the Near East. Yeast, one of the earliest domesticated microorganisms, occurs naturally on the skins of grapes, leading to the innovation of alcoholic drinks such as wine. The earliest archeological evidence for a dominant position of wine-making in human culture dates from 8,000 years ago in Georgia. The oldest known winery was found in Armenia, dating to around 4000 BC. By the 9th century AD the city of Shiraz was known to produce some of the finest wines in the Middle East. Thus it has been proposed that Syrah red wine is named after Shiraz, a city in Persia where the grape was used to make Shirazi wine. Ancient Egyptian hieroglyphics record the cultivation of purple grapes, and history attests to the ancient Greeks, Phoenicians, and Romans growing purple grapes for both eating and wine production. The growing of grapes would later spread to other regions in Europe, as well as North Africa, and eventually in North America. Grapes are a type of fruit that grow in clusters of 15 to 300, and can be crimson, black, dark blue, yellow, green, orange, and pink. “White” grapes are actually green in color, and are evolutionarily derived from the purple grape. Mutations in two regulatory genes of white grapes turn off production of anthocyanins, which are responsible for the color of purple grapes. Anthocyanins and other pigment chemicals of the larger family of polyphenols in purple grapes are responsible for the varying shades of purple in red wines. Grapes are typically an ellipsoid shape resembling a prolate spheroid. There are several sources of the seedlessness trait, and essentially all commercial cultivators get it from one of three sources: Thompson Seedless, Russian Seedless, and Black Monukka, all being cultivars of Vitis vinifera. There are currently more than a dozen varieties of seedless grapes. Several, such as Einset Seedless, Benjamin Gunnels’s Prime seedless grapes, Reliance, and Venus, have been specifically cultivated for hardiness and quality in the relatively cold climates of northeastern United States and southern Ontario. An offset to the improved eating quality of seedlessness is the loss of potential health benefits provided by the enriched phytochemical content of grape seeds. 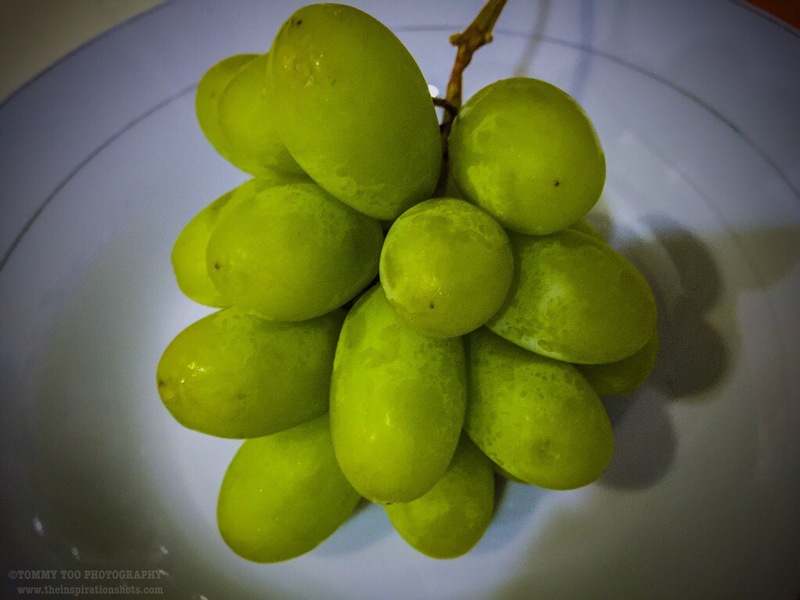 Posted on September 5, 2016, in iPhoneOgraphy 366, Photography and tagged #iphone6plus, #iphoneography366, #photography, fruit, greengrape, photooftheday. Bookmark the permalink. Leave a comment.